Are you prepared to organize a clutter free bathroom? Bathroom usually accessorize with lot of things such as brushes, combs, shampoo and lotion pumps, hair barrettes, toothpaste etc. 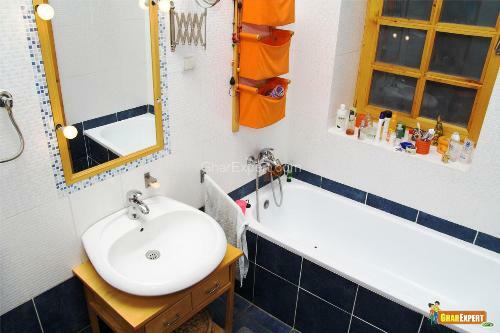 that create a lot of clutter in bathroom. No matter is your bathroom too small or too big, the matter is how you organize it with the option described in this article. See some tips to store your bathroom accessories. Install towel rails and racks on wall that match with your bathroom countertop and put rolled towels and washcloths on it. Use hooks on the back of doors to hang towels, gowns etc. Make cabinets under the sink they gives extra storage to the bathroom. Shelves are also give the space to put your accessories easily access. Put cotton balls or swabs, combs, sponges in small wicker baskets and store them on the shelf. Other tips, interior related ideas, and pictures are available in the rest of the article. 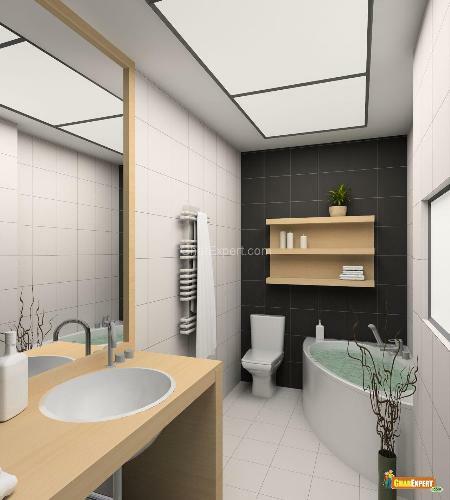 It is very tricky to space up your bathroom by implementing the ideas. If you think the space in your bathroom is not enough and the things make bathroom cluttered, follow these tips to maximize the space and make it clutter free space in your bathroom. 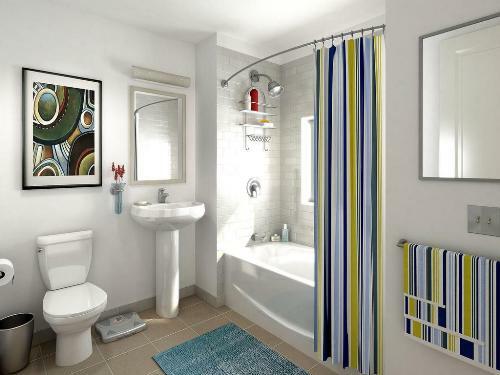 Paint your bathroom in light colors as they give spacious feel. Install skylight and bay windows to make bathroom look large. 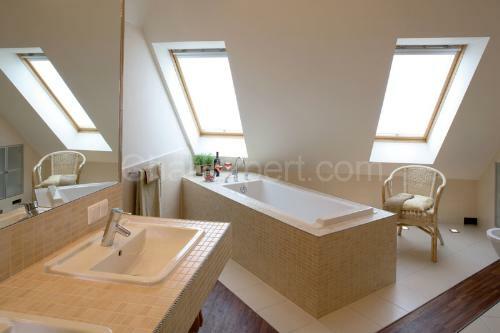 The skylights provide ventilation to bathroom and reduce darkness. Use mirrors to make space appear larger because they reflect lights in all directions besides giving decorative touch. 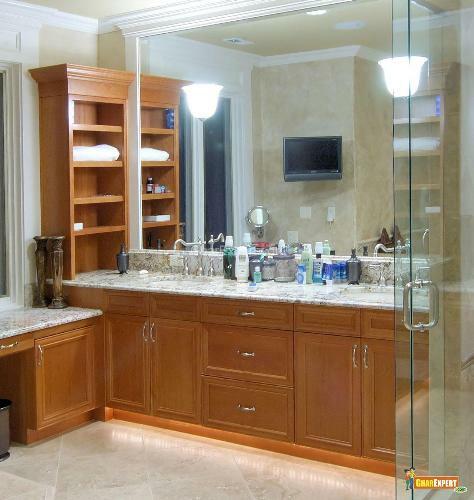 You can place full length mirror to enhance the décor of your bathroom. Apply storage units such as cabinets, drawers, shelves etc. to maximize storage space in bathrooms. Clear your bathroom countertops, cabinets with a shiny and deep surface. 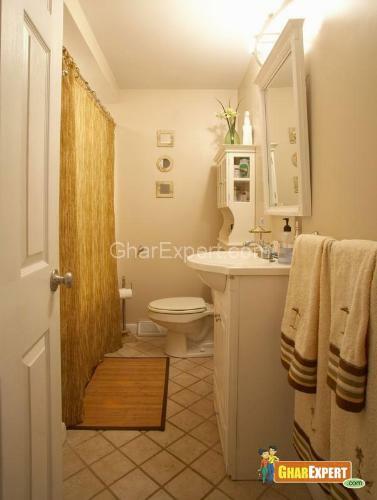 Also, opt for shelves when you are looking to maximize bathroom space. You can make bathroom clutter free by using storage spaces such as cabinet, dresser and vanity cabinet in your bathroom. They always help you to get organized with your bathroom. You can organize your bathroom by using closed, hanging and open storage. Choose a vanity cabinet with basin above, it can be used as a wash basin as well as vanity cabinet and this cabinet also make your bathroom clutter free. Always remember the size of your bathroom when you are tried to place a bathroom vanity cabinet. 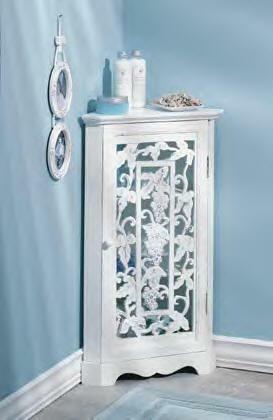 Nowadays vanity cabinets are available in large variety, styles, and designs and with single or double sinks. Vanity cabinets make storage organized and clutter free. Wall attached cabinets are also good for storage and organization in bathroom. Fix cabinets on the wall up to ceiling as they easily save the space of floor. Cabinets provide space to make your bathroom clutter free and are always helpful to maximize the space. 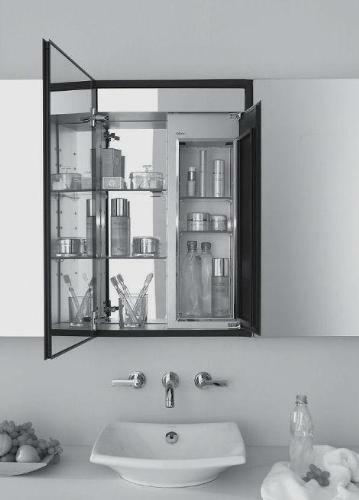 You can also choose a mirrored door cabinet above wash basin to increase the sense of space and conceal a deep cupboard that provides ample hidden storage for toiletries and medicines. Just see the image given below. You can make hanging storage in bathroom by using some of these hanging items such as curtains with pockets, shelves, hooks behind the doors, wine rack on wall, hangers and hanging wicker baskets etc. 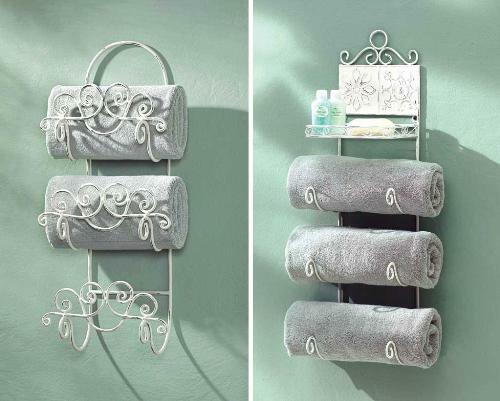 All hanging items provide clutter free bathroom and decoration in the bathroom. You can store your needy things in hanging storage items, they are easily access. Bathroom shelves also provide space to make bathroom clutter free and always help to maximize the space. 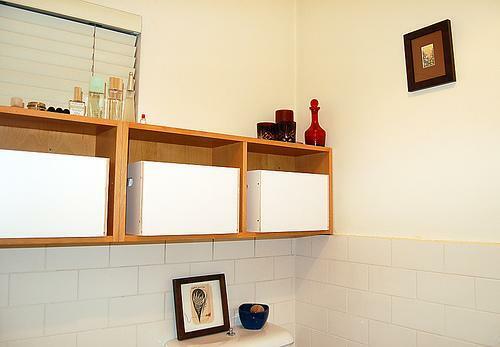 Shelves provide open storage in bathroom whereas cabinets are used to give closed storage. 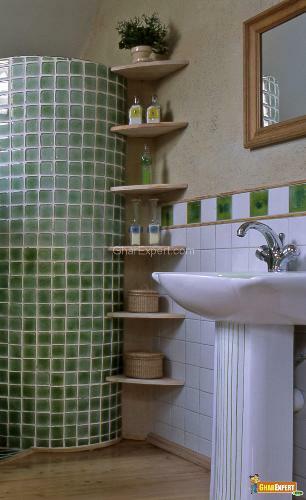 Install two shelves in bathroom, which can nestle a series of square baskets, provide more storage space. You can also place wrought iron free standing shelves to store your towels. A wrought iron or wooden rack stand can be placed in a corner with three or four shelves to provide storage and a decorative touch to bathroom as well. An old shoe rack is also a fantastic idea de-clutter other rooms. 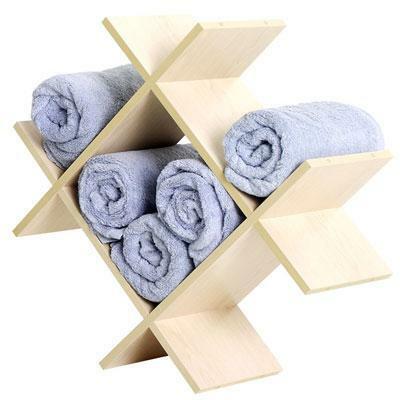 Place it in your bathroom corner; you can use it to put towels, napkins, wicker baskets and other useful things on it. If you have shower in bathroom and want to separate it with other space. To save the space of shower cabinet, use a curtain or screen to divide shower rather than using shower door. It will save the space of shower cabinet. Make use of linear storage as it will save the space of the floor and provide you an open storage space in a line. 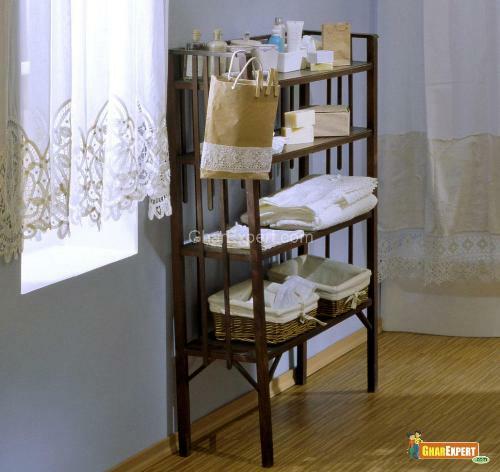 Make the shelves between joining space of walls and hold your shampoo bottles, lotions and wicker basket on the shelves. You can also put a small plant container on upper shelf to decorate.